Need someone to walk your dog a few days a week? My name is Olivia and I am looking to take your dogs for a walk. 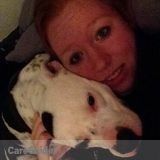 I am a recent graduate from the veterinary technology program at Medaille College. I currently work at a doggy daycare and have 5 dogs of my own. I am great with all breeds and have a general love for animals. I also can cut your pets nails dogs and cats for $5 dollars an animal. Walks can range for $15 dollars for a half hour walk per dog to $25 for an hour walk. Discount rate for multiple dog homes. Dogs may be walked in groups, but can be an individual walk if your dog is not friendly with others. I also am available for dog sitting in your home or mine. Seeking an Animal Lover Opportunity in Fort Erie. I am able to come to houses to walk,feed and groom if needed.